For the trail crew to be as effective as possible, knowing what needs to be done before setting out on a work day is paramount. This becomes especially true after carrying an assortment of heavy tools up and down a mountain, only to realize at the end of the day, you only used half of them. 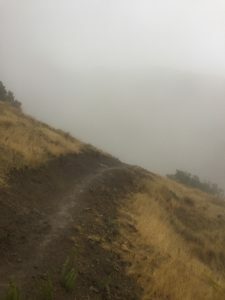 To make the most of our time and perform the best possible work, it is crucial that we scout the trails early, identifying all the different things that will need to be done to keep the trail safe and sustainable. Scouting a trail can be done in all seasons, but for many, the most enjoyable time is during the spring melt. This time of year the trails see an abundance of water and can often mimic small creeks as the water flows down, and hopefully off the trail. You can see exactly how the water interacts with the trail, where it is coming from, and where it is building up. Hopefully this is when you also can commend yourself on drainage structures previous installed, but inevitably you find where drainage needs to be improved. Later, as the foliage builds up, it’s important to identify where the trail corridor is being breached, so you know where to bring along the loppers to brush it all back. Finally, if trees have fallen across the trail, or are precariously hanging over, saws will be needed to remove them from the path. Hiking a trail to identify what work it needs goes beyond what tools to bring. If a section of the trail has begun falling off the hillside, a likely fix is to install a retaining wall. However, to do this you may need large rocks, so it’s important to discover whether the necessary resources are nearby, or if a different solution will need to be pursued. Along with this, a key element in scouting a trail is discovering where individuals are venturing off the trail, creating what we call social trails. Social trails can create a lot problems, not only for navigating, but disturbing much larger areas than the sanctioned trail. 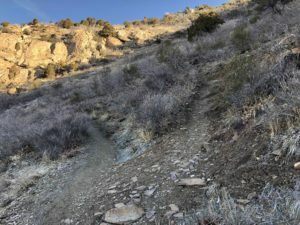 The most common solution is to “junk up” these trails, so a scouting trip would need to find the necessary down trees, rocks, and brush to appropriate close off these social trails. By sharing some tips for scouting a trail, we hope that our community on the trails can appreciate how much work goes into maintaining this beloved network. Additionally, we invite them to practice their own scouting, and if they’re so inclined, let us know what they find!